On the turn for home it was only a two horse battle between Gerry Harvey’s Sisterhood and Ballymore’s Soul Sista (pictured) with the latter finishing on top over the final stages to break through for a well-deserved victory at Waipa yesterday. The four-year-old was ridden like the best horse in the race, by leading apprentice Rory Hutchings, and travelled nicely in behind the leaders throughout the 1400m journey. Upon approaching the turn, Soul Sista peeled out to be three-wide and produced a stylish turn of foot which could not be matched by her rivals. “She shouldn’t have been a maiden for as long as she has, but she was ready and Rory gave her no excuses. 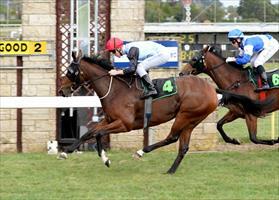 It was great to see her pick up the win and I think she can go on with it now,” said co-trainer Chad Ormsby. The New Zealand team will present one runner over the weekend in Unknown Pleasures who lines up at Tauranga in the Rating 75 event over 2100m with jockey Reese Jones to carryout riding duties. The daughter of Edenwold has produced some solid efforts of late and she will be stepping up to 2100m for the first time. “We think she’s looking for the extra trip as she hasn’t been finishing her races as well as we know she can. We just hope the track doesn’t receive too much rain between now and Saturday,” Co-trainer Chad Ormsby said.